ASPEN A crowd of more than 200 filled St. Mary Catholic Church at 10 a.m. Thursday to say farewell to Chris Bove, 35, who died Sunday after a ski accident at Snowmass.”We are gathered here to say good-bye to someone who died before his time,” the Rev. Michael O’Brien said to open the service. Bove had been an instructor at Challenge Aspen since 1998. And both coaches and skiers who worked with him, as well as friends from town, filled the church.Bove’s younger brother, Andrew, delivered a short eulogy at the end of the service. He said the definition of happiness is in knowing what you want in life and succeeding in getting it. But while his older brother wasn’t always happy and didn’t always know what he wanted in life, “he knew that he didn’t fully know these things,” Andrew said. 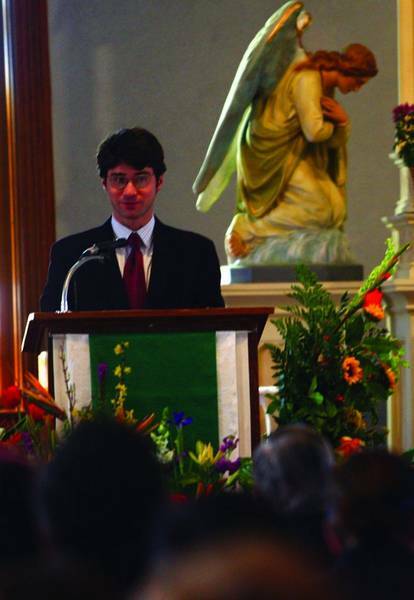 And Chris had a way of getting by, and bucking authority in a “comically complicated, but fundamentally correct way,” Andrew said.The congregation proceeded to the Snowmass cemetery for a burial service.Charles Agar’s e-mail address is cagar@aspentimes.com.